Oma does not drink sodas and limits the amount of her tea intake. Infused Water is something Oma has been wanting to try for a while. Since I drink about sixty-four ounces of water daily, jazzing it up was definitely something I wanted to review. FlavFusion Infuser Water Bottle has a very stylish look. Indentations on the side of the bottle for your fingers and thumb make gripping the bottle very easy and comfortable. I love the locking feature! When unlocked, the lid opens easily with a simple press of a button. It has a wide opening that makes it easy to place slices of fruits inside. Tip: You do not have to use fruit for your Infused waters. This vegetable and herb infused water is as flavorful as it is healthy. Mint can help with digestion and relieve headaches. Let “fuse” for about twenty-four hours - Really tasty. 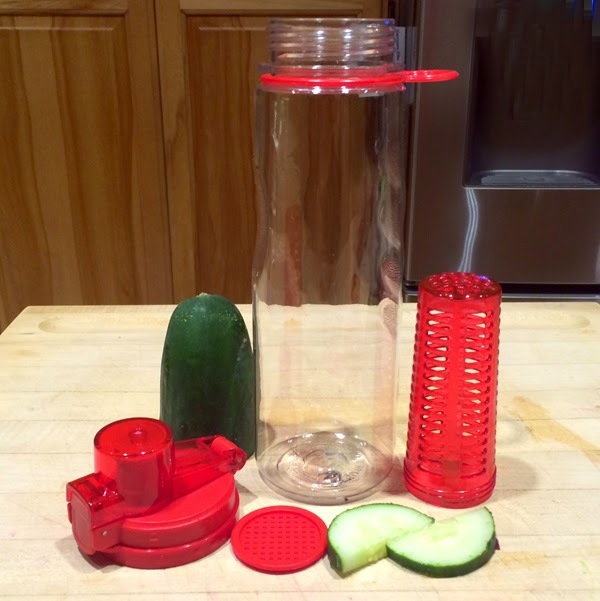 Oma’s FlavFusion Infuser Water Bottle will receive a lot of use! It fits into my car’s cup holder perfectly. 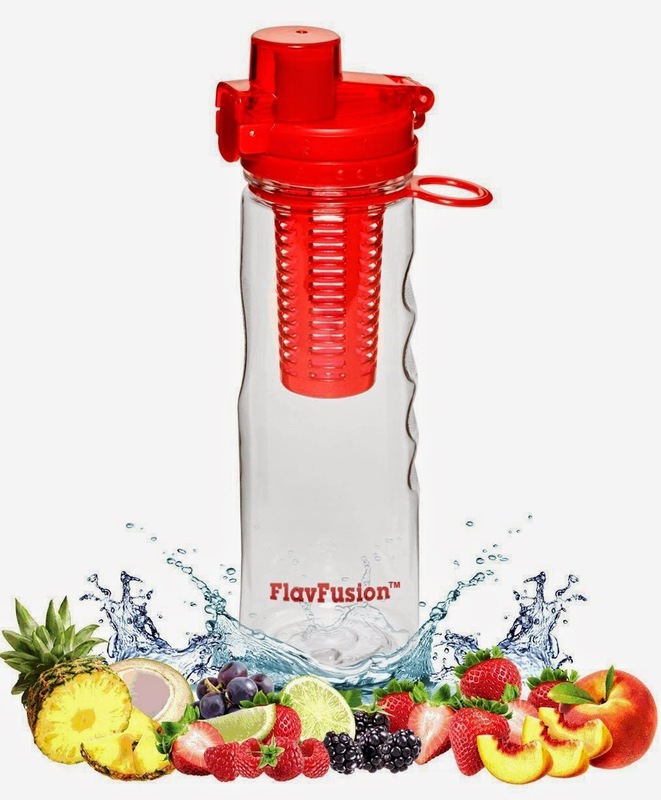 Drink More Water and be Healthier with the 25 oz FlavFusion (TM) Infuser Bottle by Big Easy Brands. It's BPA & Lead Free and made of Tritan Plastic. No longer worry about Toxins and Chemicals Seaping into your Drink. beverage. Save Money since there will be No need to buy Flavored Water from the Grocery Store. Plus, avoid those beverages that contain Artificial Sweeteners and can result in Weight Gain. Just Flip and Sip! 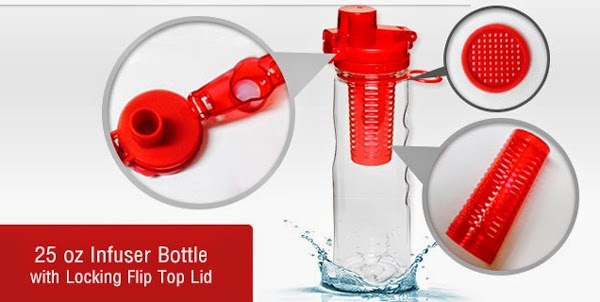 It Features a Locking Flip Top Sipper Lid for Easy Drinking on the go and a Large Opening for Easy Filling and Cleaning. The loop at the top provides a great way to carry it. You can hook it to your backpack when taking a hike. If your hands are full you can grab it with a finger and carry it with ease. The bottle is Light Weight and Easy to Use, can Go Anywhere and it Fits most Cup Holders so No More Messes and Spills! Just Fill With Water and add Your Favorite Fruit whether it be Strawberries, Raspberries, Pineapple, Lemons, Limes, etc. Cucumbers are also great. Close the Lid, Shake and ENJOY! Leave it in the refrigerator overnight for an Intensified Infusion!